GRILL DIRECTIONS: In large resealable food storage plastic bag, combine lemon juice, 1 tablespoon of the oil, garlic, salt, basil and pepper; mix well. Add chicken. Seal bag; turn several times to coat. Refrigerate 2 to 8 hours to marinate, turning once or twice. Heat grill. When ready to grill, remove chicken from marinade; reserve marinade. 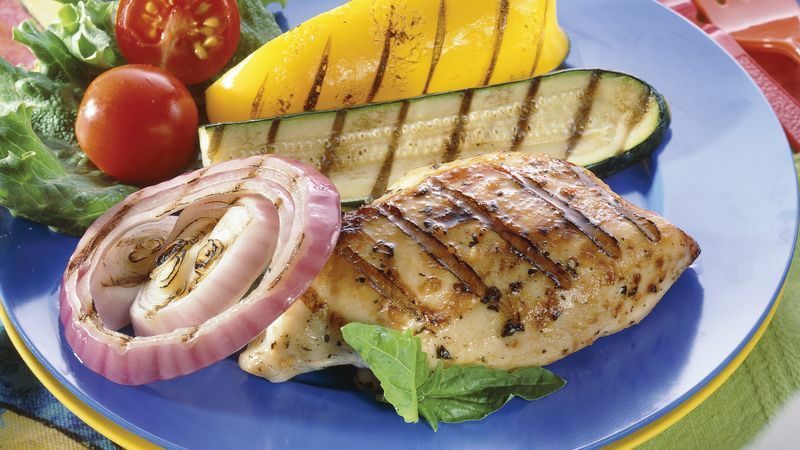 Place chicken and vegetables on gas grill over medium heat or on charcoal grill 4 to 6 inches from medium coals. Brush vegetables with 1 tablespoon of the remaining oil. Cook 12 to 15 minutes. Cook chicken until fork-tender and juices run clear, turning once and brushing occasionally with reserved marinade; cook vegetables until crisp-tender, brushing with remaining 1 tablespoon oil. Discard any remaining marinade. Reserve 2 chicken breasts and half of the vegetables for Chicken and Veggie Melts. To broil chicken and vegetables, place on broiler pan; broil 4 to 6 inches from heat using times above as a guide, brushing chicken with reserved marinade and brushing vegetables with remaining 1 tablespoon oil. To cook the vegetables, place them in a grill basket. The basket allows you to turn the vegetables with one easy flip, and small veggies don't fall through the grate of the grill. Baked beans and sliced tomato salad are good with this grilled recipe. Offer iced tea to drink. For dessert, serve fresh peach slices over Häagen-Dazs® Vanilla Ice Cream.